About six weeks ago I provided a saliva sample to DNA testing company 23andMe after purchasing a kit on sale. Along with many others, my results have now come in. Carole Riley has blogged about her haplogroup and health results here. I won't cover that ground again in full. In short: my maternal haplogroup is U2e which is fairly uncommon but not unknown in people of European background. There were no surprises in my health results (phew!) except for the trait "Likely sprinter" and having half the average risk for breast cancer. That was a pleasant surprise, given my family history, but not a result I'll be counting on too heavily. I had 325 matches when I first looked, but as more kits were processed the number increased through the day to 337. My closest predicted match was at the fourth cousin level. I had 28 predicted fourth cousins. Most of the rest were predicted fifth cousins but often with a range of 4th to 10th cousins. There were more matches that I expected, but it would have been nice to see a few third cousins in amongst the results! Linda McCauley has posted some comments about the Relative Finder here. Following on from Linda has said, I have found it a little confusing to know where and how the different public/private setting are applied but like her I have come to the conclusion that I will make my profile public, and make sure that it is public also in Relative Finder and Ancestry Finder. There are separate tick boxes for the Relative and Ancestry Finders, so make sure you've checked them. It seems to be different to making your profile searchable. The importance of this setting for genealogists is that you are limited to 5 invitations to Relative Fnder matches per day. However, public matches can be contacted without using up a daily invitation hence making it clear that you are interested in contact and making it easier for others to contact you. I've seen arguments on discussion boards within the site for keeping your profile private (so people won't just skim your surnames and leave if they think there's no match, or take all your information without sharing) but for now I am trying it out with a public profile. In my next post I will talk about the Ancestry Finder. This is where it gets interesting! 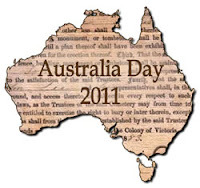 I am delighted to be able to present to you a list of the Australia Day 2011 genealogy posts in reponse to my suggestion. So far I have only skimmed most of the entries as I compiled the list, but I am looking forward to visiting each of them as from what I have seen they make great reading. I was amazed by the positive reaction to the idea and would like to thank Geniaus, Shauna Hicks, Judy Webster, Gould Genealogy and Inside History magazine for their tweets, posts and Facebook status updates. My apologies if I have missed anyone, every mention was appreciated. I will continue to update this page as I am advised of or find more posts, so please email me if you have posted but do not appear. If you can't wait for my next update, the tireless Thomas MacEntee of Geneabloggers has created a roll up of Australia Day posts by Geneablogger members, here. The discovery of an original document provides a breakthrough in family history research. Discovery of a convict ancestor is a pleasant surprise. On 28 Feb 1839 Ellen Campbell and her 13 children arrived in Sydney from the Isle of Tiree, Argyllshire, Scotland. Ellen's sons later became pioneers of Gippsland, Victoria. Her daughters married COCKBURN, COULSON, HOLMES, LAMONT, MACDONALD, McKENZIE, McNAUGHTON, WEBSTER and WELLS. Her youngest daughter, whose name (believe it or not) was Duncan, is still a mystery. Not your typical genealogy document, this post is based on an 1803 painting of pink Hibiscus titled "The Carrajan" by Mrs Bellasis, Sydney. The passenger list for the barque 'Himalaya' which arrived in Melbourne on 30 September 1840. Which document to choose? Something from Elizabeth Phipp's shady past, or something from one of her partners James Westbrook or William Magick? A document that dates from Perth in 1832, within 3 years of the new Swan River colony in Western Australia. Bobby's ancestor had a watch fetish back in England that landed him in deep water. The next thing he knew he was in the land 'down under’. Tanya didn’t have a hard choice to make about who she would focus on for this post. Her 3rd great grandfather George SIMMONS/SYMONS arrived in Australia as a convict in 1840 and has, so far, provided her with the earliest documented evidence of her Australian ancestors. Australia Day 2011: Was my first Ancestor in Australia John Lee? The time and circumstances of his arrival are not yet known - convict, ship's officer or some other answer? What we do know is that John Lee was living in Victoria, Australia in 1849. As John has both European and Aboriginal ancestry he tackles the question in several phases. As the case demands with Australia Day / Survival Day / Invasion Day, it all depends on a point of view and perhaps thinking a little outside of the box. A parish register record proves disappointing for Pauleen, until she discovers that a second register exists. Isaac Richardson is Alona's earliest ancestor, and only direct line convict found (at least to date). He was no criminal, he just happened to be caught up in riots at the time, was caught, and was "made an example of" by being sentenced to death. Thanks to the townspeople in his local village in Kent petitioning against this, his life was spared, and he was then transported for 'Life' instead to Van Diemen's Land. Aboard the Bellona, Thomas and his wife Jane Topp (1757-1827) were the first free settlers to arrive in New South Wales, on 15 January 1793. Nicholas Delaney, a United Irish rebel in 1798, who was condemned to death for murder, reprieved, sent to Australia in the Atlas II in 1802 and built some of Australia's earliest roads. He became an innkeeper and farmer and was one of the first to settle West of the Blue Mountains. Canadian Jen doesn’t have any connection to Australia at all (except a desire to visit). So how did she find a way to participate? Her ancestors owned a company that shipped dried fruit to Australia in the 1850s. Joseph Dilworth arrived in New South Wales, with his first wife Elizabeth and son Josias Wilison on board the ship Wilson on the 7th January 1842. This is the story of three young men, transported for breaking and entering a wealthy ancestor's house in Limehouse, and how they made new lives for themselves in Australia. Carole describes the excitement of the first time she obtained a Conditional Purchase application. Conditional Purchases were introduced in 1862 as a way of getting small landholders on the land. Carole also published a modified version of the post here. Sharon was inspired by this challenge to start a genealogy blog! She kicks off with a post that shows us why you should talk family history with your relatives. Who knows what they have tucked away in a shoebox? The story of how the marriage certificate for John's 2x great-uncle William Joseph Henry BATEMAN solved the mystery of his arrival in Australia. Another new geneablogger kicking off with this challenge, Alison writes about an application to join the Queensland Police Force. Find the earliest piece of documentation you have about an ancestor in Australia. If you don't have an Australian ancestor, then choose the earliest piece of documentation you have for a relative in Australia. 1. What is the document? The document is an church register showing the marriage of my ancestor, John Lee, to Sarah Thomas at Geelong, Victoria in 1849. 2. Do you remember the research process that lead you to it? How and where did you find it? I knew of the marriage early on in my genealogical journey. John Lee's second spouse, Susanna Baker, was my ancestor. Their marriage certificate stated that he was a widower, and gave the date of death for Sarah but no name. His death certificate provided her name, and his age when he married her. Although this is a church record I obtained it through the Victorian registry of births, deaths and marriages which has a searchable index and instant download of images, for a fee. When civil registration was introduced in Victoria in 1853, the government asked for early church registers (althought not all were provided). The registers provided have been indexed along with the civil records. 3. Tell us the story(ies) of the document. There are no ages, occupations, or names identified as parents names. Fortunately, I know this information from other documents. Sarah Thomas, the daughter of Stephen Thomas (a stonemason) and Anne, was born in about 1831 in Hampshire, England. The Thomas family had arrived at Port Phillip onboard the 'Royal Consort' on 18 February 1844. John Lee was born in 1822, the son of Joseph Lee, a mariner, and Jane King. His arrival in Australia is less certain than that of his young bride. According to his death certificate, he arrived in Victoria in about 1846. If this is correct, it makes him the first of my ancestors to settle in Australia. Family legend has it that John was a ships officer but it is not known why he left the ship. An alternative theory, put to me by another researcher many years ago, is that John was an "Exile" - a convict who was pardoned and given a job on arrival in Australia, but could not return to England. The details of the Exile John Lee who arrive on board the 'Joseph Somes' in 1847 almost fits my ancestor John Lee... but I am not convinced. I find the ship's crew (if not officer) theory more convincing given that his father, brother and brother-in-law were all shipwrights or mariners. In checking details for this post, I found (at long last) the 1841 census entry for John 'Lea' where he is listed as an apprentice shipwright. While the details of his arrival in Victoria are not known, one thing we do know is that John did not come to Australia in pursuit of gold, which wasn't discovered in Victoria until 1851. He and Sarah lived in the south west Victoria area around Geelong, John working as a grocer and storekeeper. John and Sarah had eight children. In 1866 Sarah Thomas died at age 35 of an abscess of the liver. Four years later John was still living in Modewarre, working as a shopkeeper, when he married my ancestor Susanna Baker (1840-1899) - but that is the story of another document. Information presented is a work in progress. Additions or corrections are appreciated. Source information available on request. If you are connected to this family, please get in touch, I would love to hear from you! I recently issued an invitation/challenge to bloggers to submit a post for Australia Day (26 Jan) based on the earliest piece of documentation they have about an ancestor or relative in Australia. Details are in an earlier post. The invitation is not just for Australians! Anyone is welcome to join in. The only condition is that you need to have at least one piece of documentation about an ancestor (or relative) in Australia. Once you've posted, send me an email (see my About me page for the address) with the URL and a short paragraph describing your post. I'll aggregate the responses and post the collection. Australia Day is on this coming Wednesday. I'm really looking forward to reading your posts. I'd better get on with writing mine! Today was the big day. I used my first ever FHL film! The film was the Amherst Hospital (Victoria, Australia) admissions register (over two films, actually). I have a copy of the Genealogical Society of Victoria's (GSV) Victorian Goldfields Hospitals Index on CD and knew that the families I'm currently focusing on had admissions there. While I waited for the films to arrive, I started searching the CD index for other ancestral families I knew were living in the area. What an exercise in frustration that was. The CD didn't run on my desktop computer. I can get it to run on a laptop, but the display doesn't work well on widescreen. I can only see the very top edge of some buttons at the bottom of my screen, and had to refer to the help file to find out what each button did. I could have lived with a shonky user interface if the other features of the CD were more helpful. It was possible to search for a name, but little more. There was enough information in the fields returned to get a good idea of if you were looking at a person you were interested in, but it wasn't possible to filter the results by hospital (or anything else), and it wasn't possible to sort the results on any field. Even that I could have lived with but it limited exports to 200 at a time - which had to be hand selected from the full list of results returned for the search. Looking for relevant entries was going to take a very long time. I was starting to hate that CD! Fortunately, I had decided to join the GSV and my membership came through while I was in the midst of grappling with the CD. I was able to access the members' version of their "Genealogical Index of Names" instead. Having given the CD a big thumbs down, I give the members' database a big thumbs up. It includes the hospitals database, has more searchable fields, and allows you to click through to additional information. A free guest version of the database is available, but the results give only a fraction of the detail of the full database. I think I'm going to get my membership value from that database alone. If you have research interests in Victoria it's definitely worth a look. observations [which do not seem to be the same thing as the remarks]. Not all the fields are filled in for every admission, of course, but there's plenty of potentially interesting material. Next post, I'll report my research findings. Australia Day falls on 26 January each year. In 2010 I had a last-minute thought that it would be nice to do an Australia Day blog post. I did a quick search of my database for any events that occured on 26 January, and posted the result. I was surprised and pleased when Geniaus and Carole Riley joined in. If only we'd had more time to prepare! This year I've given it more thought. Geniaus has made the brilliant suggestion that we should collate the posts somewhere. If you join in, please email me (see the About Me page for my email address) with the URL and one short paragraph describing your post. I'll put together a post that collates and links to all the offerings. I haven't mentioned this in a post before. It's a belated Christmas gift to myself. I've become a DNA junkie before my first results are even back. a chance to go to the post office: I need an international money order for an English probate package, which I will post to England, and then wait the estimated three weeks plus return post time to get the document that confirms who my GGG grandfather is (of course it will!) back to me. There are a few other things that I want to order from various places, but I'm pacing myself. I don't want everything to come at once - bills for my purchases included. It's like being a kid waiting for Christmas day! I'm not a big resolution setter. I find it a glass-half-empty kind of exercise. In a fit of New Year's enthusiasm you set yourself a list of resolutions. A year goes by and you berate yourself for the things you didn't accomplish... but you know next year will be better... Repeat. What fun. On the other hand, I would like to get to the end of a year and reflect on all the things I did, and the progress I have made. So, here is my list of long-term-goals-that-don't-have-to-be-done-in-2011-but-it-would-be-nice-if-they-were. I am currently blogging a little over once a week on average, which feels about right. My goal is to at least maintain this level of effort. I currently comment on only a fraction of the blogs I read. I would like to increase this (see Geniaus' post Blogging is a two-way street). Unfortunately I could not see any way to track how many comments I have made so I will have to go on my perception of whether I am commenting more when I assess myself against these goals next year. I have set up a personal research data website www.twigsofyore.com and a few family members have joined up. I want to have some sort of a public opening of the site and make it more widely known among my research contacts. I currently have 47 photos and 15 documents uploaded - I estimate the final figure should be more like 500+. In 2010 I changed my filing system. I have moved all hard copy documents of birth, death and marriage certificates over to the new system, but still have 54 electronic version yet to move. Then I need to cross-check the hard copies against electronic versions to ensure that each document is filed both ways. Most other documents have been moved to the new system already, the notable exception being census records. Through 2010 I reduced the amount of time I spent poking around aimlessly in various databases. My goal is to feel that most of my genealogy time has been productive and if at any point it does not feel productive, either go back to my research plans or get off the computer and on with my life. I would like to do more genealogy study - this time something assessible to see if more formal study suits me. I would also like to attend at least one genealogy event, if the opportunity arises. Over the last several months I have been in active contact with four to five other researchers at any one time. It has been incredibly valuable, not only the exchange of documents but also the discussion and bouncing of ideas. My goal is to maintain contact with those I am currently corresponding with and to aim for similarly valuable relationships with future contacts. I have spent a fair sum of money on DNA tests recently. My goal is to learn more about the possibilities these tests create and to exploit the results to the full. It's only the last year and a bit that I have (re)joined any genealogy societies. My goal is to at least maintain my current memberships. My goal is to start writing up a document about one of my ancestors, with the aim of producing a booklet for family members. Hopefully the first of many. I have enough "how to write your family history" books. I would like to find and read examples of interesting, well documented, family history books to inspire me with 10 above. Suggestions welcome. This is hard. My currently level of giving back is minimal. I have tried in the past to participate in indexing projects but have had great difficulty getting pages back within the allotted time. I find getting out of the house difficult while I have little children which rules out more possibilities. I would like to find some way of making a contribution. Text corrections on Trove are looking like a possibility, but I will remain open to other ways of making a contribution. Is this an excuse to keep reading dozens of blogs and playing around on Twitter? Why yes, I think it is! Don't bite off more than I can chew!I failed this at times last year. 2011 will be better, I know it!! !